Mission Statement: To preserve and protect the natural, historical, cultural and recreational features of the area in and around Beaman Park. We advocate for conservation and resource protection through activities, fund raising and community education. Beaman Park Proctor Barn Restoration! The Beaman Park Proctor Barn Restoration project will stabilize and restore a 100-year-old barn structure on the 188-acre Proctor Farm tract at Beaman Park. The barn is an example of a Middle Tennessee stock barn that would have been found on an early 20th century working farm and given its size, would have been the focal point of a very large working farm. Once $50,000 of the projected $200,000 needed for restoration purposes has been raised, then Metro Parks will put the project out to bid. The renovated barn will be the centerpiece of the Proctor Farm trailhead once it is restored to its original condition when it was the heart of a thriving Middle Tennessee farm in the early 20th century. The appearance of the restored barn should be such that when visitors step inside, they step back in time and are able to visually experience what early farm life looked like. 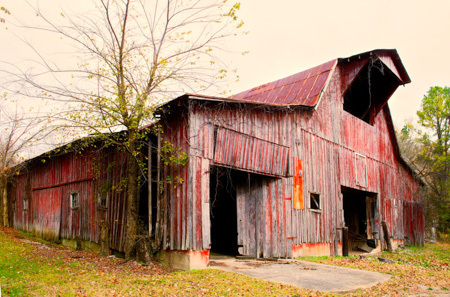 The purpose of restoring this barn is to preserve and interpret the agricultural heritage unique to this part of Davidson County. Barns such as these are becoming few and far between due to the fact that so many of them have not been properly maintained. The barn will provide a location for community gatherings and school field trips, with demonstrations of traditional agricultural practices. This will further enhance the corridor between Bells Bend and Beaman Park as the location for a growing movement in support of sustainable farming practices, local artisans, regional artists, and folk musicians, while bringing back a tradition of hospitality engaged in serving the community. This project provides another way for Beaman Park to serve the community as a Metro Park facility for gatherings and school field trips, demonstrations of traditional agricultural practices, and other events appropriate to the area for generations to come. The Friends of Beaman Park is an all-volunteer organization. Our work is primarily accomplished through volunteer management, fundraising and grant writing. Since 1996, FOBP has initiated park support activities in a variety of areas that fall into four main categories: Education, Advocacy, Park Facilities and Land Protection.